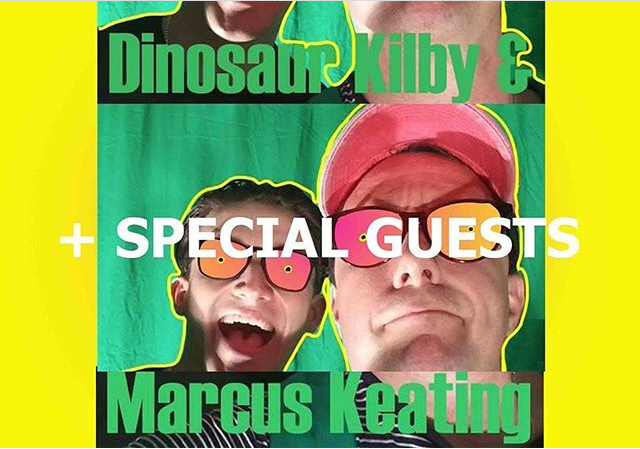 + special guests is a collaborative, interactive performance by Dinosaur Kilby and Marcus Keating. Taking the form of a film studio, audiences will play with different personas of the two artists, represented as chroma green and blue colours. The constructed environment within Vivid Projects will attempt to experiment with ideas of dichotomy within contemporary pop culture where everything is either a meme or a gif. Scripts will be presented to participants to activate the performances in which art history and pop culture characters; important to the artist’s development, are littered throughout. Vivid Projects will be split into compartmentalized sections, separating the staging and live streaming areas. Through the use of costumery and props, layers of post-apocalyptic pop references are literally and ludicrously coated onto audiences. + special guests is the first collaborative work of Dinosaur and Marcus. It will focus on the success and failure of the experimental aspects of performance. Through testing and questioning the exhibition format, the artists are trialling in Vivid Projects’ space, examining notions of viewer and artist, performance and sculpture.